A must-have orchestral brass collection for film, TV and game composers. 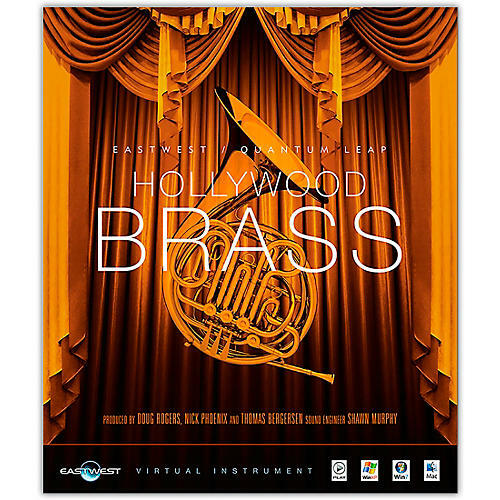 The second installment in the Hollywood series, Hollywood Brass is an epic achievement, once again combining the talents of Producers Doug Rogers, Nick Phoenix and Thomas Bergersen and award-winning Sound Engineer Shawn Murphy. Recorded in EastWest Studio 1, widely regarded as the "best brass recording room in the entire world" with 5 true mic positions, Hollywood Brass is designed to work seamlessly with the other EastWest Hollywood libraries. Running on the next generation and completely revamped engine, PLAY 3, Hollywood Brass will run flawlessly on your system. Hollywood Brass ships on a hard drive and is approximately 150 gigabytes of pure Hollywood magic. A world-class group of brass artists, worthy of a Shawn Murphy recording, was gathered for this brass sampling marathon which lasted for 21 straight days followed by a year of post production.